Temple Kol Ami Emanu El is the first synagogue with a "Green" designation in Broward county. We take sustainability and our responsibility to protect the environment for future generations seriously. 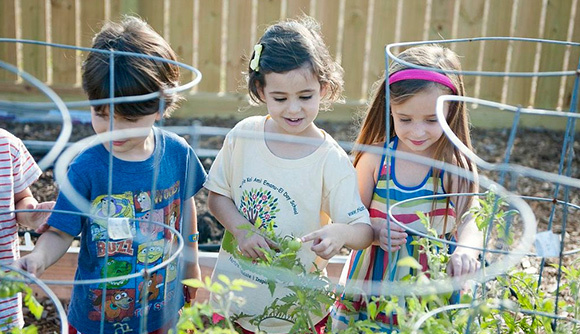 Our outdoor organic community garden was created and is maintained by congregants and school children from our early childhood program, religious school and Gesher program as well as our neighboring Imagine Charter School. Beautiful sunflowers and ripe vegetables are abundant in our garden. Our garden serves as the site for many eco- educational activities and other Jewish environmental innovations and as a source of nourishment. Our garden is the focus of an annual tu'bishvat celebration. We're always looking out for adult and children budding gardeners! Please contact the temple office to get involved.